With Independence Day approaching, and summer in full swing, it can mean only one thing-it won’t be long until the beginning of football. 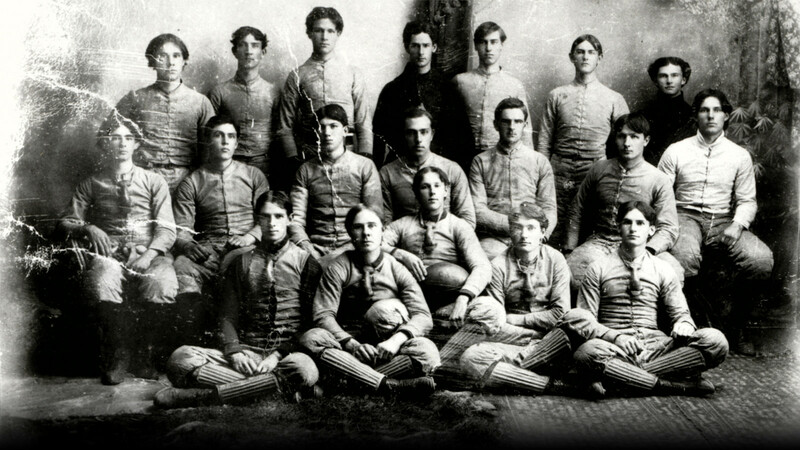 However, in 1896, the first year of Clemson football, practice did not start until October 5. Clemson began practice on a 50×200-foot field in front of the college. It is believed that this field was located in front of what is now the student union building (the area between Tillman Hall and the Trustee House) on campus. Also, the first football team had training rules to be followed to the letter. They were as follows: (1) Will report promptly to all practices prescribed by the coach unless physically disabled or prevented from attending on account of college duties. (2) That in any of the above instances, we will report the facts beforehand, when possible, to the coach. (3) That we will not, without the consent of coach and trainer, eat anything at any time except at the training table; will not drink an alcoholic beverage or spirituous liquors or soda water. (4) Will not use tobacco in any form or engage in any form of dissipation. (5) Will retire not later than 11:00 p.m. unless permission is granted by coach and trainer or prevented by college duties. (6) Will obey the directions of the coach and captain on the field of play as before specified, and use our influence to promote discipline both on and off the field of play. Practice continued and as one description put it “a hardy group of early Tigers who cared little for their skin and bones turned out for practice and began enthusiastically slamming each other to the rock-strewn practice field.” Without any capital, the team’s first equipment was personal property, but other necessary equipment was purchased with money that was willingly contributed by members of the faculty and student body. Equipment in the early years consisted of very little padding except at the knees and elbows. Tightly fitting and laced leather or canvas jackets were the main body protection against the crashing effects of mass plays and left little for a tackler to grab. A few had nose and shin guards. Due to the lack of helmets and need for head protection, the players wore long hair. After gruelling practices, the first-ever Clemson game day finally arrived. On October 31, 1896, Clemson traveled to Furman more than likely by train. This was the first time that many of the Clemson players had seen a full-sized gridiron. George Swygert, center on the first Clemson football team, recalls the Furman game and the first season as follows: “With Professor Riggs as our coach, we got in shape fairly well. Our first game was with Furman, the biggest men I have ever seen, and believe it or not we won that game! We had a few trick plays. One was when the play ended near the sidelines, our lightest end would hide the ball under his sweater and as the two teams moved toward the center of the field for the next play, he appeared to be injured, [and] then when things were clear, he would made a bee-line for the goal. This worked maybe once a game; it worked against Furman our first game.” Very few details of the 1896 Clemson-Furman game are known, but it is known that Charlie Gentry scored Clemson’s first touchdown in history. The Tigers defeated Furman 14-6 in Greenville, SC. Clemson’s upset win over Furman was a monumental milestone for the school. Furman was considered at the time an experienced team, having played the game since 1889 (the year Clemson was founded). A member of Clemson’s first football team, Shack Shealy was the head coach of the Tigers in 1904. He holds the distinction of being the only Clemson player to have coached his alma mater. Shealy coached Clemson one year and guided the Tigers to a 3-3-1 record overall, which included wins over Alabama, Georgia, and Tennessee. The first-game victory set a postive tone and gave the team momentum that Clemson would build on for the next few years.